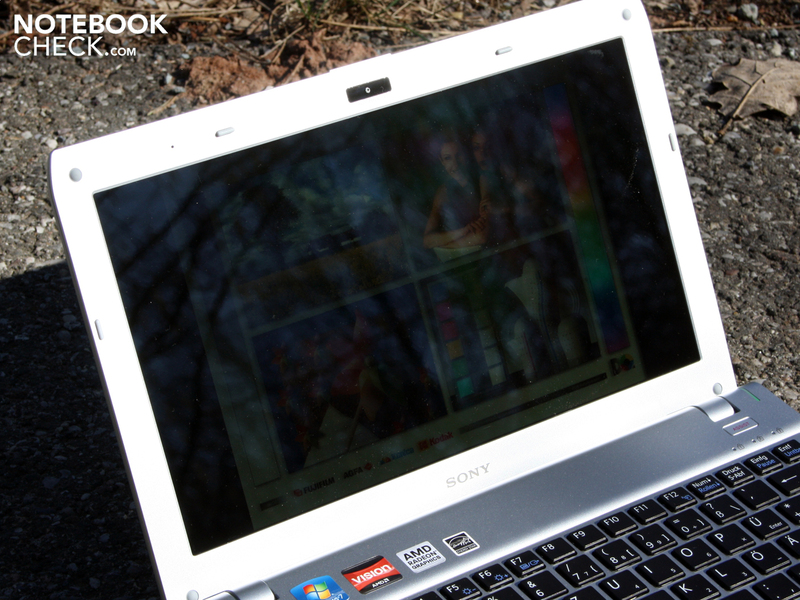 Sony Vaio VPC-YB1S1E/S: The perfect consumer mini subnotebook? Is AMD Fusion instead of Intel Core the better choice? 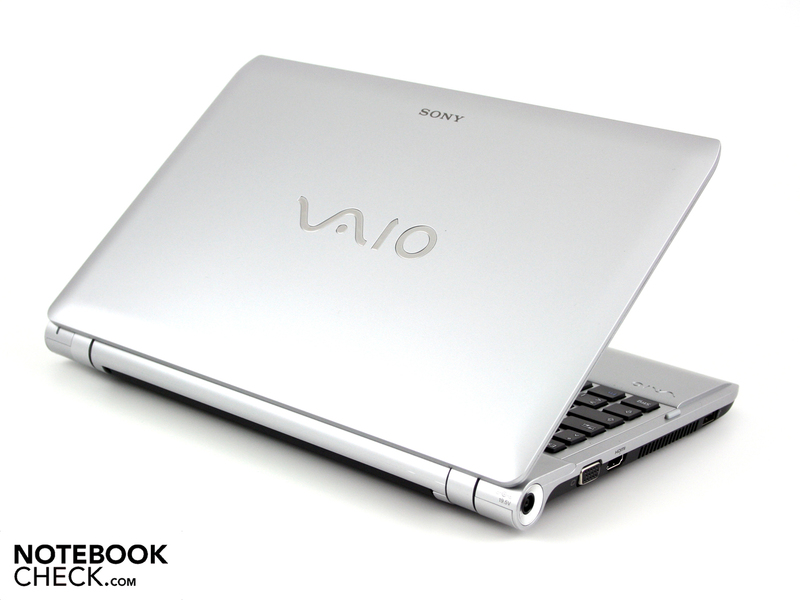 With the Intel based sister model Vaio VPC-YA1V9E/B Sony announced the beginning of its 11.6 inch subnotebook era in February of 2011. The easy to handle device with its weak low voltage Core i3 was well put together, but only delivered usable battery run times of four hours (WLAN test). We didn't get especially excited about it though with a price of 675 Euros. For the weak Core i3-380UM (2x 1.33 GHz) CPU with integrated graphics unit this was a bit too much to ask. Sony is surely aware of this, and has provided a more affordable alternative with the AMD sister model Vaio VPC-YB1S1E/S at hand. The mini is listed in shops from a mere 475 Euros. The configuration with AMD E-350 and Radeon HD 6310 is possibly exactly the same thing that Acer, Lenovo, and Toshiba are bringing to the market in their cheaper 15.6 inch Aspire 5253, IdeaPad G575, and Satellite C655D, respectively. 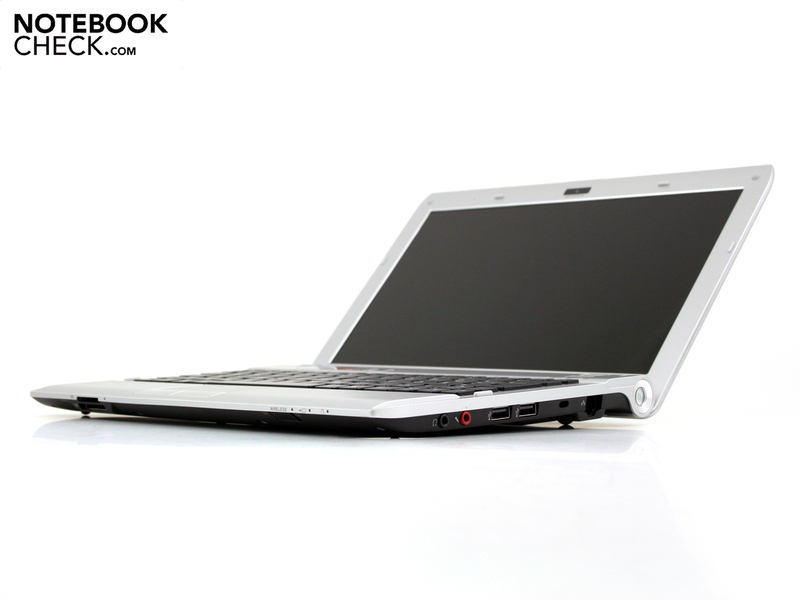 Our Vaio offers this in an 11.6 inch format, similarly to the HP with its Pavilion dm1. 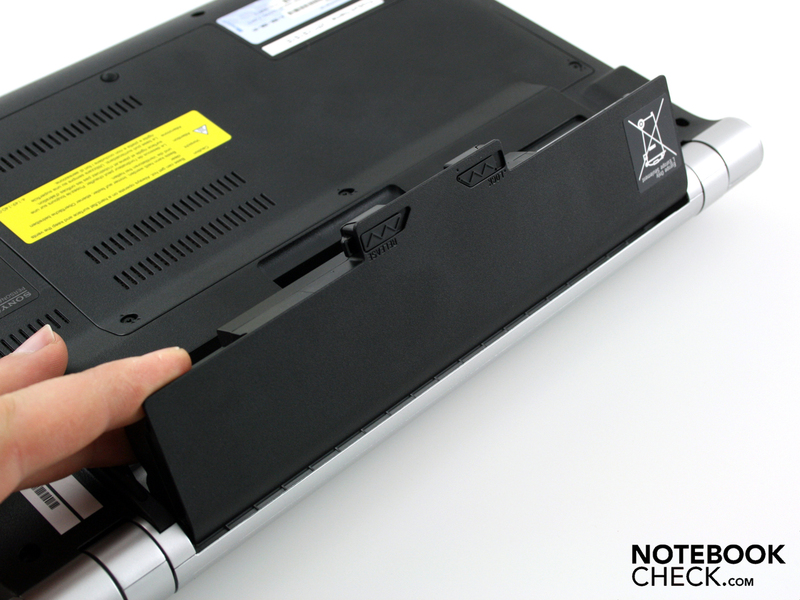 We already had to witness the weak performance of the E-350 APU in the Acer Aspire 5253 and the HP dm1. What has remained however is the competent HD decoder, and the potentially long battery life of the AMD Fusion notebooks and subnotebooks. 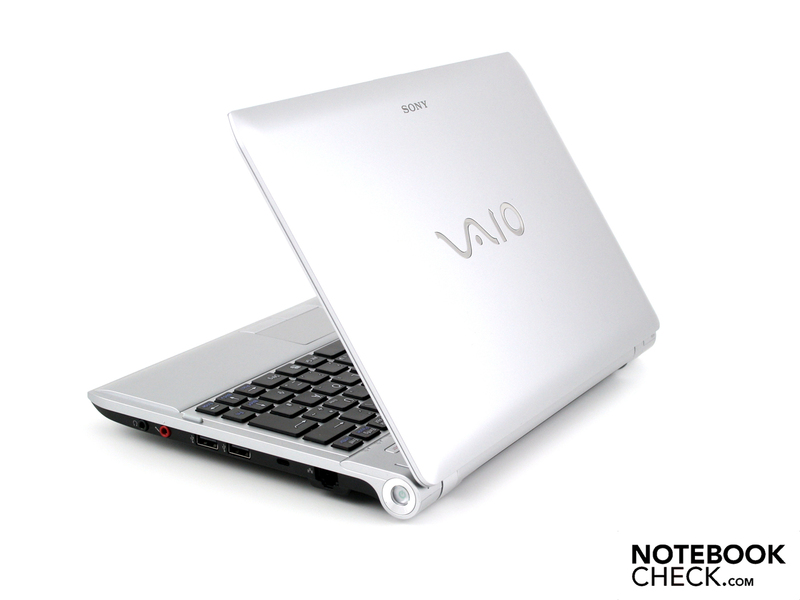 Whether this pays off with the small form factor of the Vaio YB can be discovered in this review. 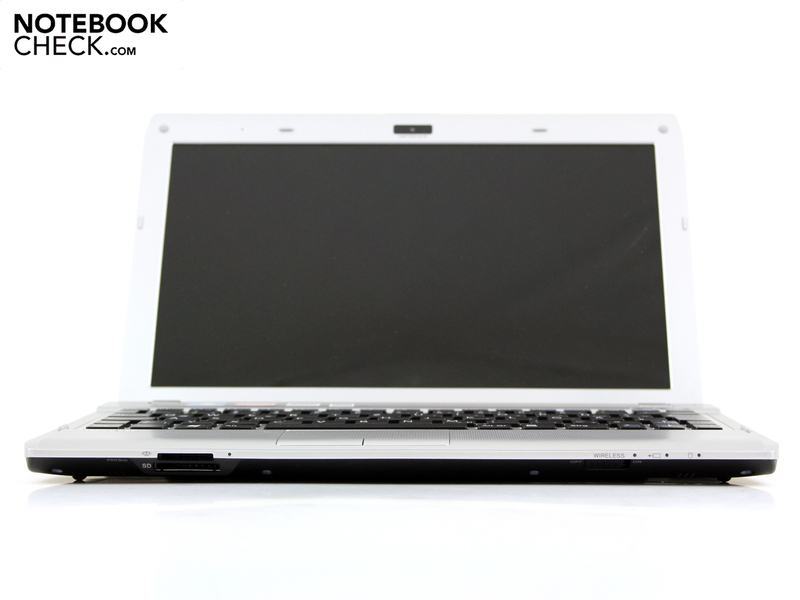 The 11.6 inch Vaio comes clad in a slim chassis that becomes thicker towards the back. 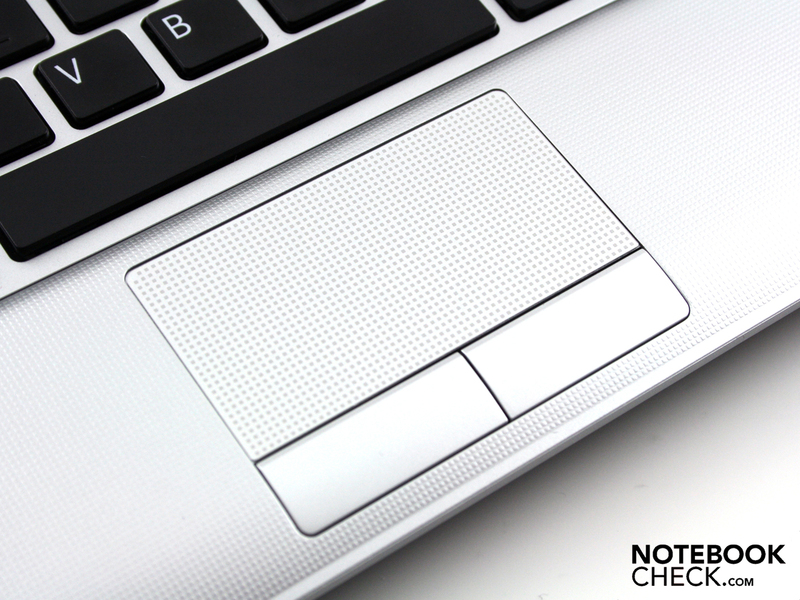 Optically the Vaio relation can easily be recognized by several features, such as the cylinder look with a raised palm resting area, along with many other smaller details. With the exception of the silver color the case of the YA- and the at hand YB-series is identical. Also the base plate with the large opening for the RAM and HDD hasn't changed in any way. The small case is very firm. Using two hands we were only able to bend it marginally. The haptically patterned plastic palm resting area is as firm as can be. The same is the case for the base plate, pressure doesn't cause significant denting anywhere. The battery doesn't overhang, although it does wobble by about one millimeter in its compartment. This won't lead to any problems thanks to the rolling mechanism. High gloss surfaces are going out of fashion. 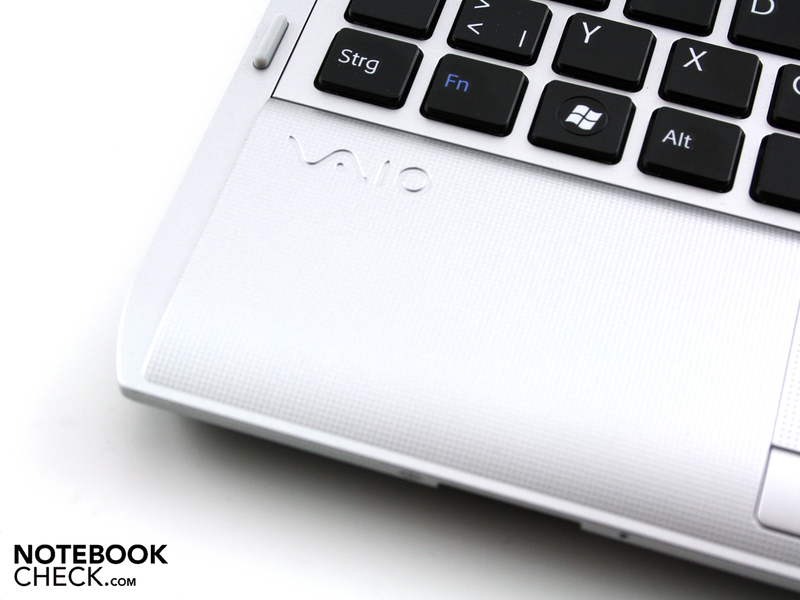 Due to this our Vaio YB is in line with the recent trend, and has foregone glossy surfaces. The matte surface of the lid repels finger prints. Together with the same surfaces on the working areas, and the structured palm resting area, the YA almost instills a sober business look. The surface of the lid could only be dented in the middle with strong pressure. Bending attempts were also restricted to a minimum. The hinges only allow a small opening angle of about 135 degrees. The hinges don't have a hard end stop at their limit, since they don't sit completely rigid in the chassis. For this reason the lid will also wobble when driving on a bumpy road. 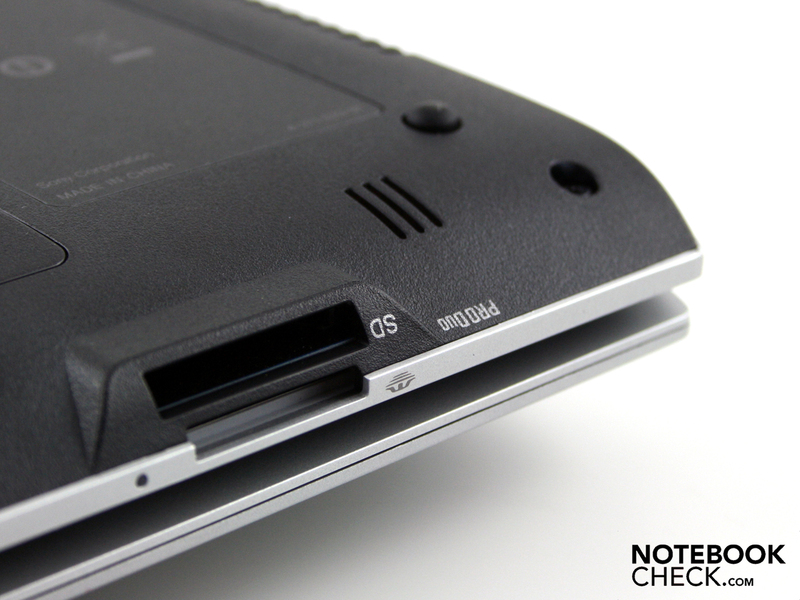 The Vaio VPC-YB1S1E/S is just as sparsely equipped as the other 11.6 inch version. 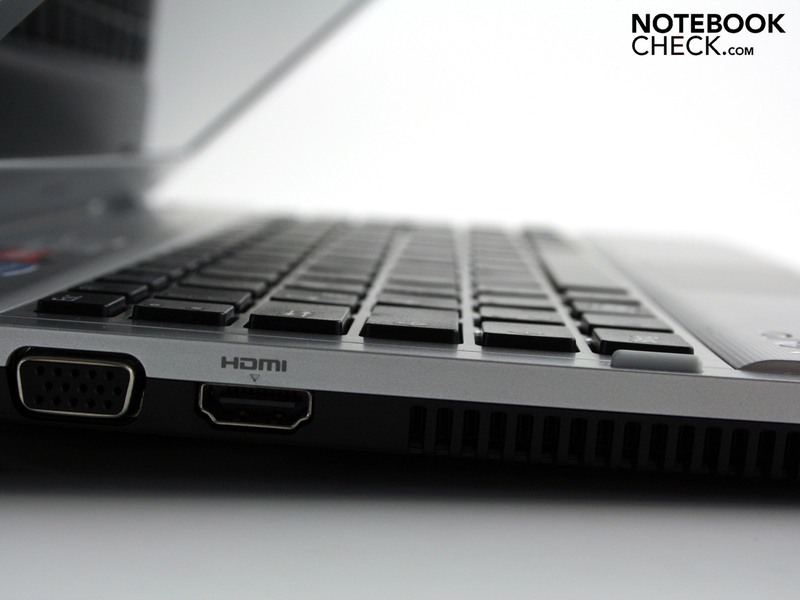 Worth mentioning would be the Aspire 1830T or the Lenovo U160. As standard for this form factor are two USB 2.0 ports (3), one HDMI, and one VGA. Especially HDMI should be useful in many scenarios when HD movies are played with the Vaio via AMD Fusion, for viewing on a large television or an external TFT in full HD (inc. movie audio). The location of the interfaces makes sense considering their application: VGA directly next to HDMI on the left side. These thick cables can easily be guided towards the back without disturbing a possible mouse. USB and audio ports in contrast are located on the sides towards the front, in this case a possible mouse could be obstructed. Worst case scenario a USB docking port could help in this respect, although there is no native docking port for the YA- or YB-series compared to the business devices in the S- or the Z-series. Large amounts of data can quickly be transferred around the home network with the Atheros Atheros AR8131 PCI-E Gigabit adapter (cable: RJ45). The Draft-N module Atheros AR9285 provides for a fast wireless connection with the router. The wireless module also provides Bluetooth 2.1+EDR. Partners for Chat still have to make due with a maximum resolution of 640 x 480 pixels from the 0.3 MP webcam. 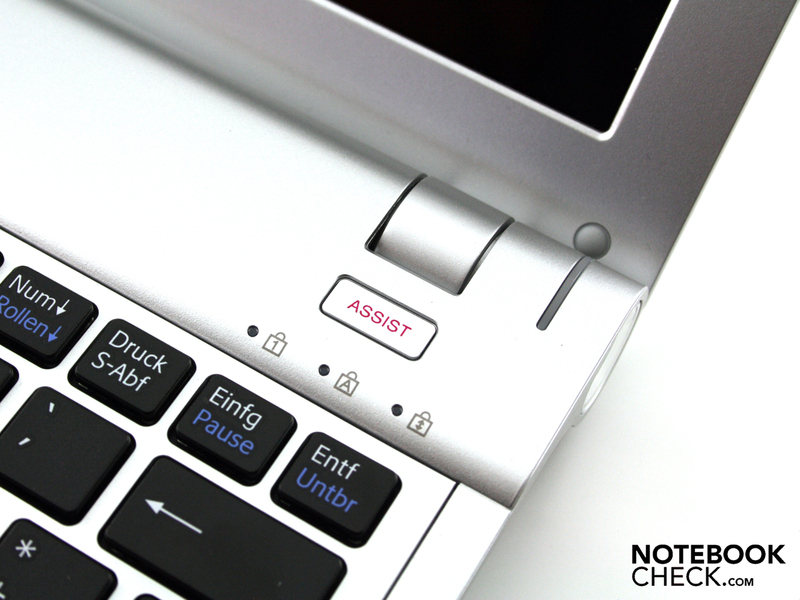 The Assist button right above the keyboard launches Vaio Care. Via the Admin-Tool users can update or burn recovery media. The new owners of the YB should also do this, since there are no recovery media included. The manufacturers warranty has a period of 24 months. This consists of a 1 year basic warranty, plus a 1 year additional warranty. Depending on the purchase location registration might be necessary. that allows access to data in the network. Plus: Control Playstation with Vaio buttons. The keys have a big distance between each other. 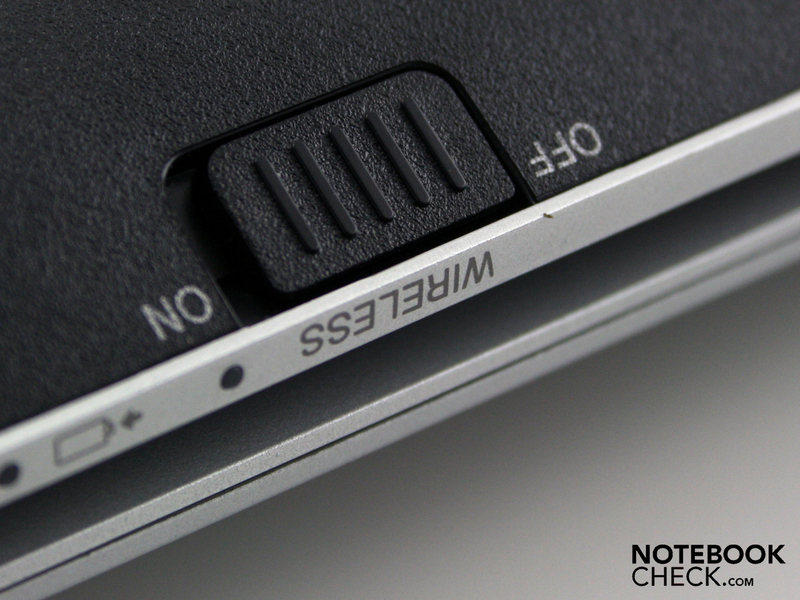 Compared to notebooks, or even desktop keyboards, they do however have a very small surface. Big hands will therefore have to practice for a while in order to achieve smooth typing. A bit of upset is caused by the tiny right shift key. This had to be scaled down in favor of the arrow keys, which is why we constantly missed it, and landed on the up arrow instead. All the keys are firmly supported - this has improved since the YA sister model. The pressure point can be described as clear, and the short key travel makes typing a bit short-winded. The end stop is firm but not hard. 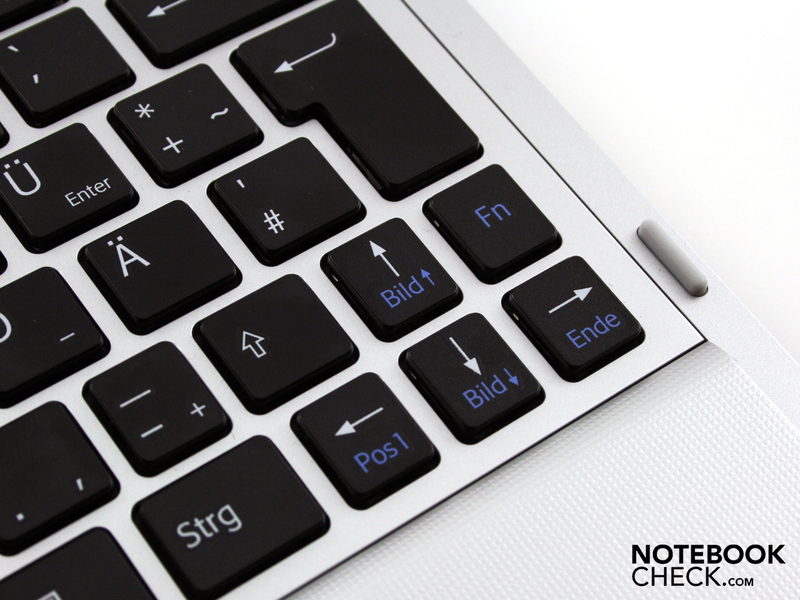 The cursor can be controlled precisely across the desktop with the small but fast surface. The usual gestures via the multi-touch pads (Synaptics V7.5 in this case), such as enlarging, zooming out, and rolling are available. The medium and crisp button travel of the mouse buttons allows for fast clicking. Unfortunately their click is also loud. The 11.6 inch measuring display from CMO (type: N116BGE_L41) has a resolution of 1366 x 768 pixels. This resolution has established itself for 11.6 inch subnotebooks, much to the delight of serious users. Compared to the still typical 10 inch netbook resolution of 1024 x 600 pixels, the oversight on the desktop is greatly improved. When it comes to the CMO panel, this is exactly the same type that is used in the YA-series (VPC-YA1V9E/B). The measurements and the following color space are therefore very similar. The display is once again reflective. This provides for more contrast, and more vibrant colors on the one hand, but also for reflections on the other. The contrast of 185:1 is weak despite of all the optical enhancements. 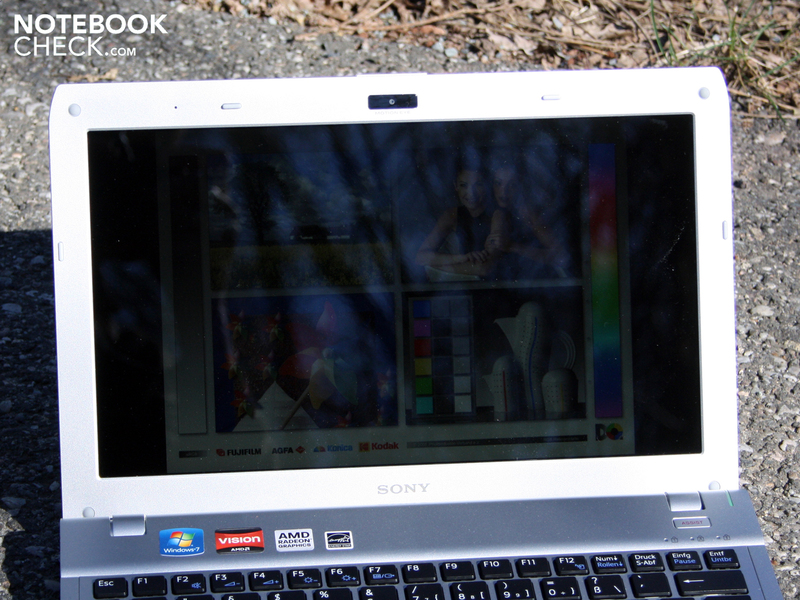 The color space, which we compared to AdobeRGB, sRGB, as well as the display panel on the Vaio EB4X FHD (transparent), is very small. Professional displays, such as those used in the business orientated Z-series (FHD & WXGA++) play in a different league. 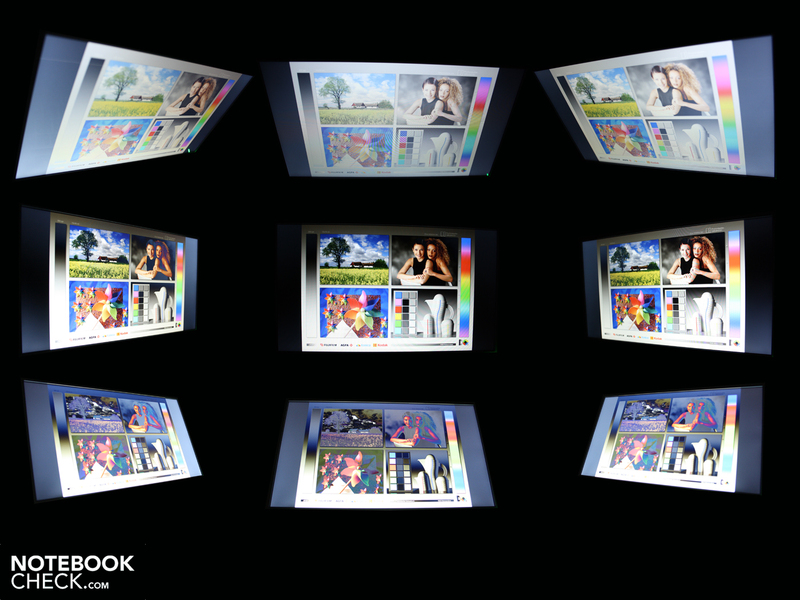 The latter of these minimally cover sRGB, and therefore fill the grid in the middle ICC picture. The good luminance of the display of 243 cd/m² on average provides for valuable points. In contrast to its sister model YA, the brightness is NOT throttled when battery operated. With respect to the distribution of brightness, the CMO panel is very good: 89% homogeneous light distribution doesn't allow for any shadows to be visible. 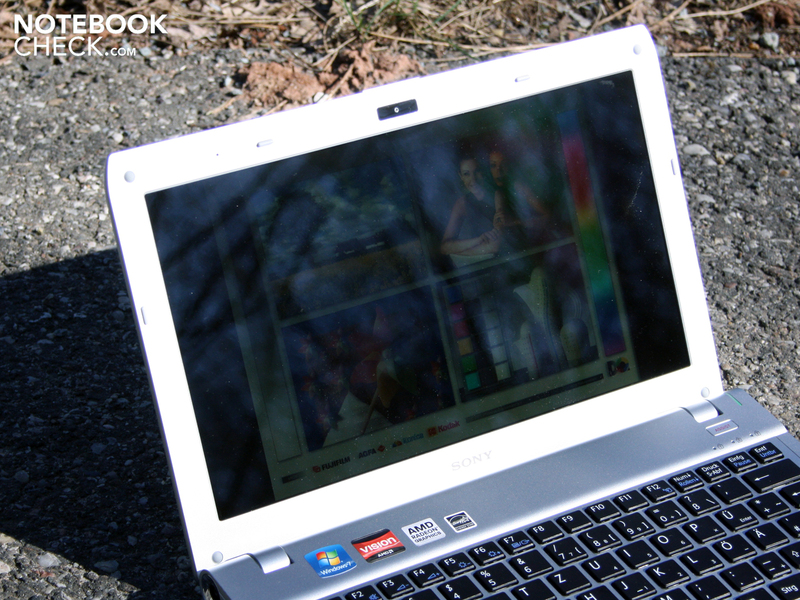 Those that will take their little Vaio dwarf to the park next summer, will always have to be on the lookout for some shade. The maximum brightness may be sufficient for sunny conditions, but the reflections are very annoying. 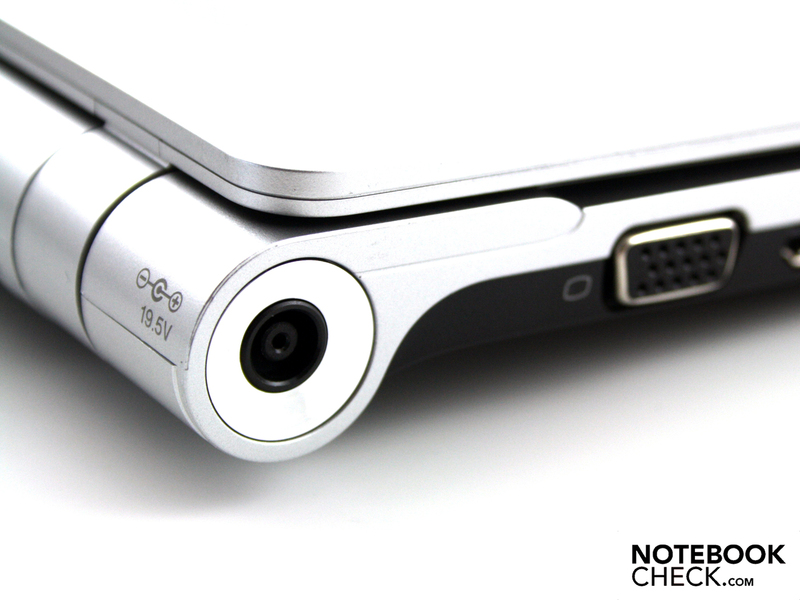 As with so many notebooks, the horizontal viewing angles are relatively narrow. Up to about 50 degrees from the central position color representation is well preserved. After this they start to invert significantly. Text can still be read up to a deviation of 80 degrees though. Should the user look from above or below (vertical), the situation is somewhat worse. Text is only clearly readable up to 35 degrees, while colors invert from 20 degrees. 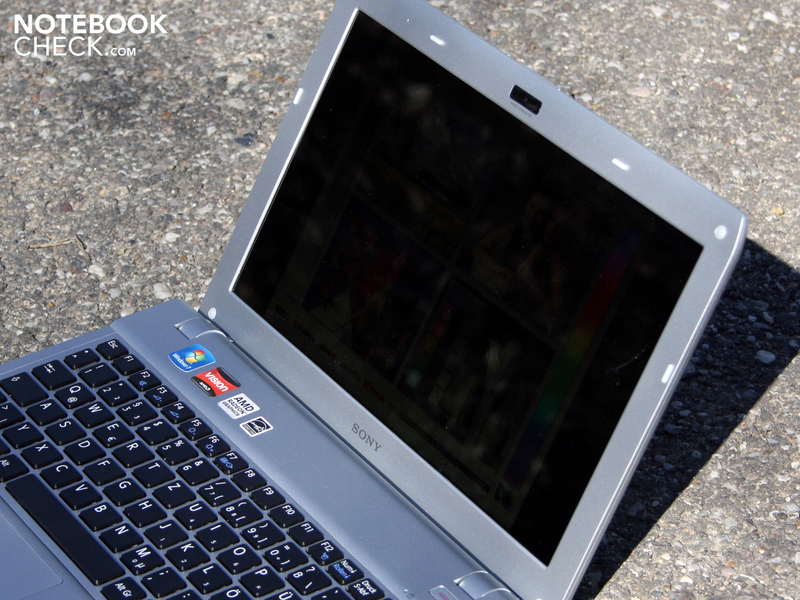 Sony has equipped its 11.6 inch Vaio with a dual core APU AMD E-350 (2 x 1.6 GHz). This Accelerated Processing Unit with 18 Watts TDP has an integrated graphics unit with DirectX-11 and UVD3 Video-Decoder for HD videos (MPEG-2, H.264, VC-1). 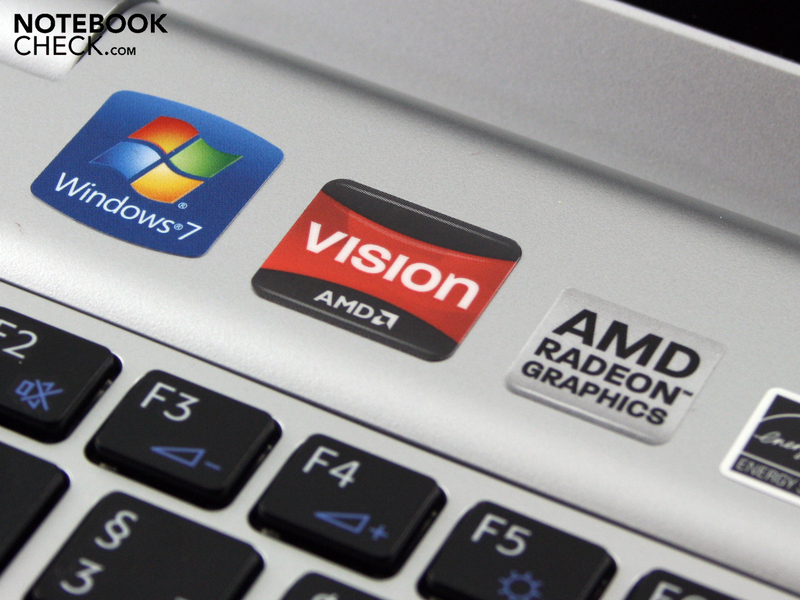 With 80 shaders and the aforementioned UVD3 video processor, the Radeon HD 6310 easily outperforms the current Intel HD or GMA 3150 (Atom netbooks), and is in line with the performance level of an Nvidia Ion. The APU E-350 has a mere L2 cache of 1024 kB. The core sits on an AMD A50M chipset, and is accompanied by 2048 MBs of DDR3 RAM. The possible upgrade to 4 GB can be accomplished easily for an affordable price (approx. 25 Euros) thanks to the second (empty) RAM slot. Unfortunately Sony only provides Windows 7 32-bit Home Premium, which is why the 64-bit APU is not used with its maximum potential. We compared the AMD E-350 (2 x 1.6 GHz) with Intel's current Atom dual core processor N550, and the Core i3-380UM (2 x 1.33 GHz) in the sister model VPC-YA1V9E/B. Core i3 and Atom dual core have the Hyper-Threading advantage of four processed threads. The E-350 can only process parallel multi-tasking operations on two cores. Whether this is a disadvantage for multi-tasking operations should be confirmed by the multi-core benchmark Cinebench R10 32-bit. The tested system reached 1992 points. An Atom N550 reaches 1463 points. The N550 is 30% slower on average. The 380UM manages to achieve, despite its slower clock speed, 3052 points. The Intel based VPC-YA1V9E/B is therefore about 35% faster. The AMD Fusion APU C-50 (Toshiba NB550D) can't even keep up any longer at this stage, it scores a meager 1271 points. When it comes to the single-core processing with the Cinebench R10 Single 32-bit benchmark, the E-350 only manages to score 1048 points. Despite the 1.6 GHz clock speed, the APU is still slower than a 380UM, which scores 1268 points with 1.33 GHz. 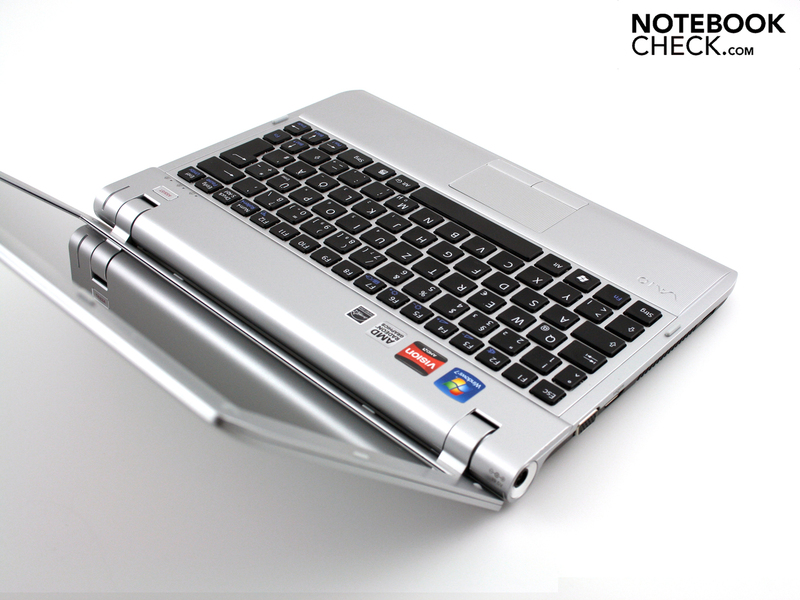 Nevertheless, the Atom N550 which just about scores 512 points, is still out performed. The APU C-50 still lags far behind (634 points). The synthetic performance examples make the AMD E-350 look good. What about the combined application performance? We used PC Mark Vantage, which tests all the components, including the DDR3 RAM, hard disc, and the HD 6310. 2044 points are the result. 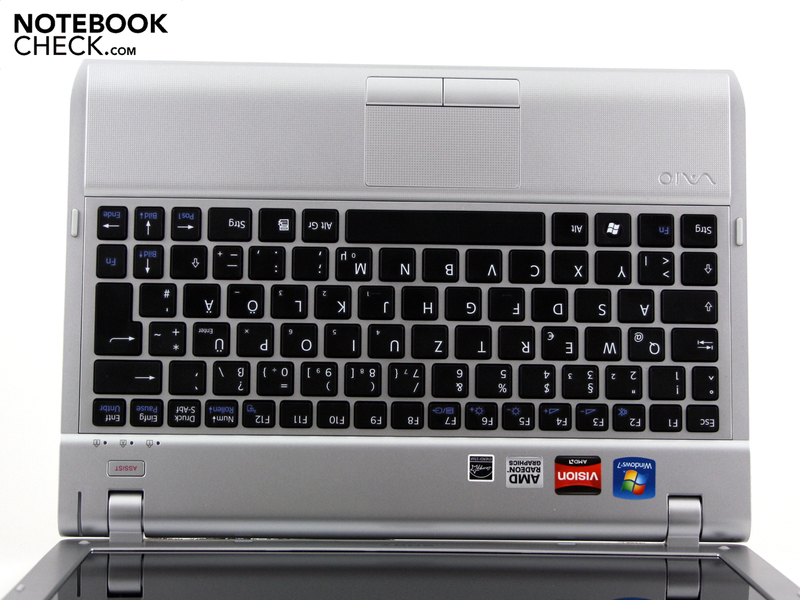 This may be better than netbooks with a C-50 (1438) or an Atom N550 (1601), but significantly worse than the i3-380UM (3265). The YA sister model is 37% faster in this comparison. This isn't the case for the 3D performance though, here there are 1980 points compared to 1134 points (Radeon HD 6310 vs. Intel HD with i3). For a comprehensive evaluation of the (weak) gaming performance of the Fusion platform see the data sheet for the HD 6310, or the tests for the Aspire 5253 / HP dm1-3180eg. The integrated HD 6310 provides for CPU support via the UVD3 video decoder (Avivo HD) for 1080p videos or other high resolution material. The decoder can decode two MPEG2, H.264, or VC-1 streams simultaneously. The question is whether the player also uses this function when it plays H.264, VC-1, MPEG2, or Adobe Flash. With Adobe Flash Player and Windows Media Players this is the case. 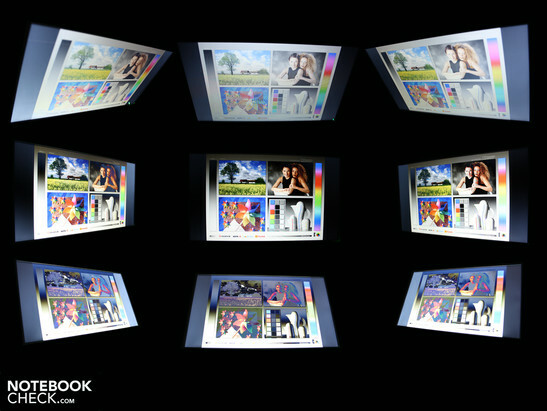 The following screen shots show the video load during battery powered use. With two simultaneous 1080p clips, one of the clips starts to judder. There is a Toshiba MK3265GSXN (5400 rpm) HDD with 320 GBs of total capacity included. The HD Tune values are in line with our expectations. The transfer rate for sequential reading is at 66 MB/s. Crystal Disk Mark also assessed the read / write rate of small and large files. Conspicuous are the low values for reading and writing of scattered 4K packets (0.6 / 1.7 MB/s). This is nevertheless typical for HDDs. Even a 7200 rpm HDD doesn't get above 0.8 / 1.7 MB/s (ST9500420AS in the HP 4720s). When surfing the web or writing emails, hence use with little load, the cooling fan turns consistently with a noise level of 33 dB(A). It is seldom that the system noise is any quieter than this, since even after an extended period of time in an idle state (also battery powered) the cooling fan only switches off for about three minutes at the most, only to come back on for a minute. We wouldn't class this noise level as too loud or disturbing though. When the Radeon HD 6310 and the E-350 were fully utilized by our stress benchmarks, the noise level rises to 43.3 dB(A). This peak level stays constant. In practice this extremely loud noise level should be very rare though, since even the 3DMark06 benchmark only raised the noise level to 36 dB(A). A glance at the blue temperature graphic shows a meager heating under load. Whereby a maximum of 37 degrees is measured after hours of stress, and therefore doesn't require any concerns about getting sweaty hands. In idle the consistently running cooling fan is an advantage for the temperature, since the temperature constantly stays within the blue range. (+) The maximum temperature on the upper side is 31.4 °C / 89 F, compared to the average of 35.8 °C / 96 F, ranging from 22 to 57 °C for the class Subnotebook. (+) In idle usage, the average temperature for the upper side is 23.3 °C / 74 F, compared to the device average of 30.7 °C / 87 F.
(±) The average temperature of the palmrest area of similar devices was 28.6 °C / 83.5 F (+2 °C / 3.6 F). The acoustic qualities are not particularly worth listening to. The very small stereo speakers emit especially high pitched audio. The two speakers are located at the front under the palm resting area, and project onto the table top. This is intended, since the table top reflects the sound and increases its volume. In this case there is only thing that helps: Headphones on and start the movie. We tried the analog audio output with two Yamaha speakers (YST-M20SDP). A simple listening test with a low output signal didn't show any audible noise. 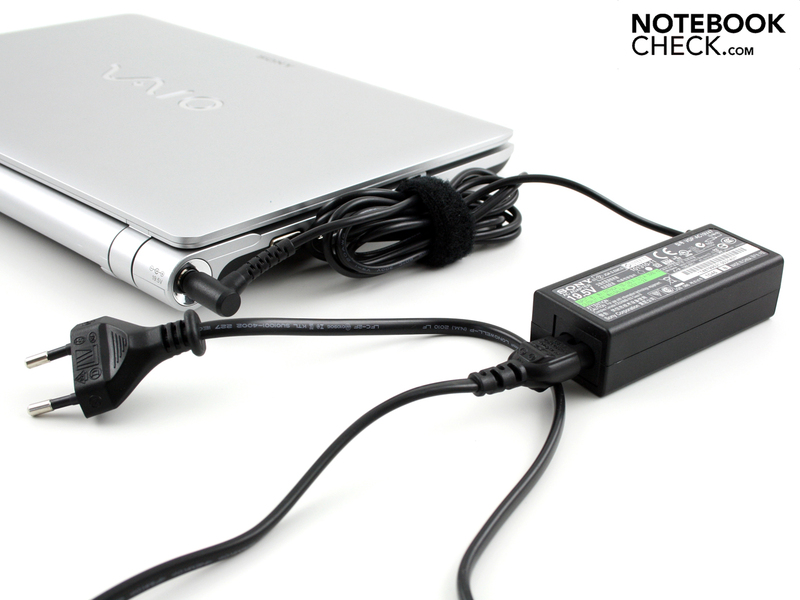 When it comes to the battery life the Vaio YB fulfills our expectations for a mobile subnotebook. 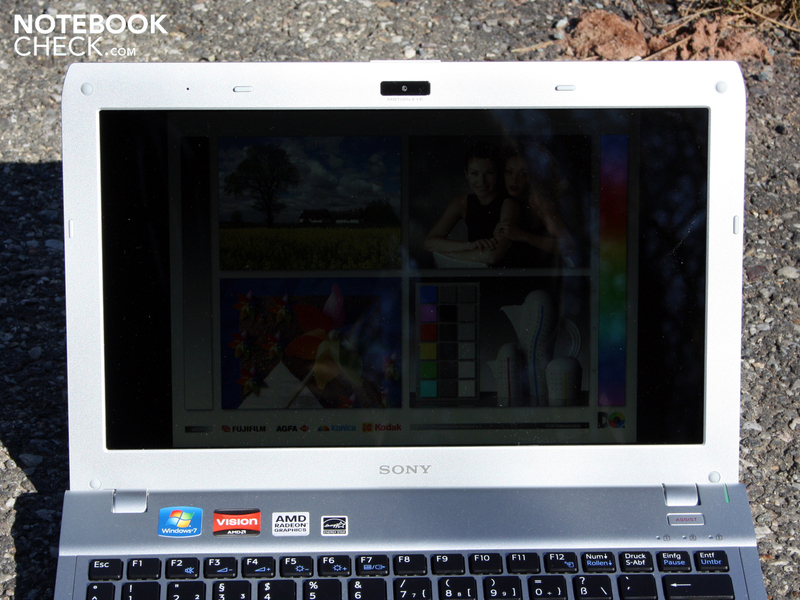 When surfing with WLAN @100 cd/m² brightness, the 11.6 inch Vaio manages exactly 4:59 hours (299 minutes). A movie on the hard disc can be watched for just as long, running for 4:50 hours (290 minutes). The practical battery run times are about an hour longer than those of the YA sister model with an i3-380UM. Under the blue battery life graphics are the shorter times of the VPC-YA1V9E/B in parentheses. The opposite happens with a constant CPU load using BatteryEater Classic (power plan: maximum performance). This test empties the battery in the shortest time possible, which still takes a good 2:47 hours though. AMD Fusion uses energy sparingly, we measured a meager power consumption of 8.1 Watts (7.6) in idle, and 21.5 Watts (16) under load with 3DMark2006. Depending on the power plan, brightness, and the activity of the wireless module, the idle power consumption can reach up to 11.2 Watts. The Radeon HD 6310 in the Vaio YB provides for the better performance compared to the Intel HD (YA series), with a bigger power consumption under a 3D load. 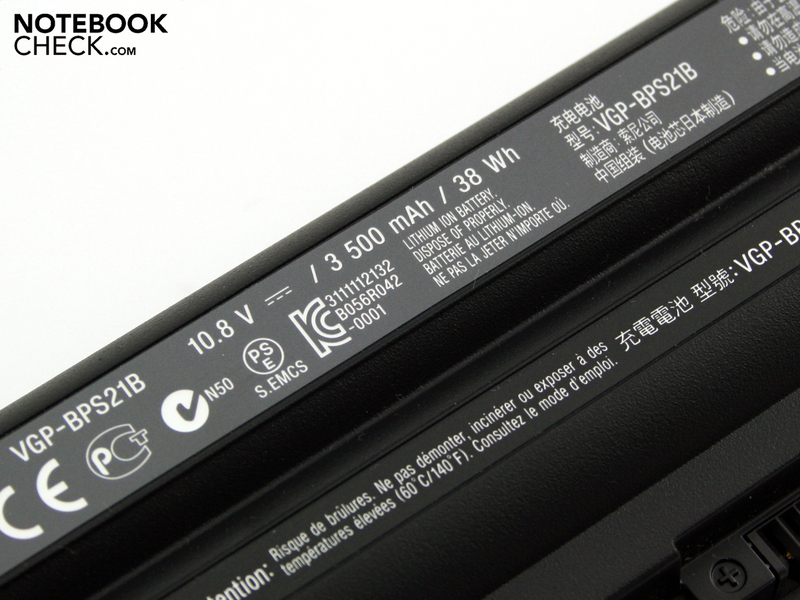 When the 11.6 inch Vaio is working during the stress test, the power consumption rises to 29 Watts (31). The battery was fully loaded for these measurements. The 40 Watt AC adapter is well dimensioned for this power consumption. With the Vaio VPCYB1S1E/S from 475 Euros, Sony has created a price wise interesting mini-subnotebook, which can stand out from the competition. With respect to the pure CPU speed, the 11.6 inch Vaio is more a netbook than a subnotebook, since the processing speed is only just faster than that of an Intel Atom dual core. The advantage of the AMD Fusion platform becomes obvious when it comes to 720p or 1080p movies on the HDD or via YouTube. The Radeon graphics help with the decoding and cover the weak AMD C-350 APU's back. The energy saving system manages to get five hour battery run times out of the 38 Watt-hours battery. This is approximately one hour more than the Intel Core i3 version Vaio YA. The downside for mobility is the reflective display panel. The case and lid are solidly put together, and the input devices are reasonably good, although not perfect. Unfortunately the consistently noisy cooling fan makes itself noticeable even during a prolonged idle state. 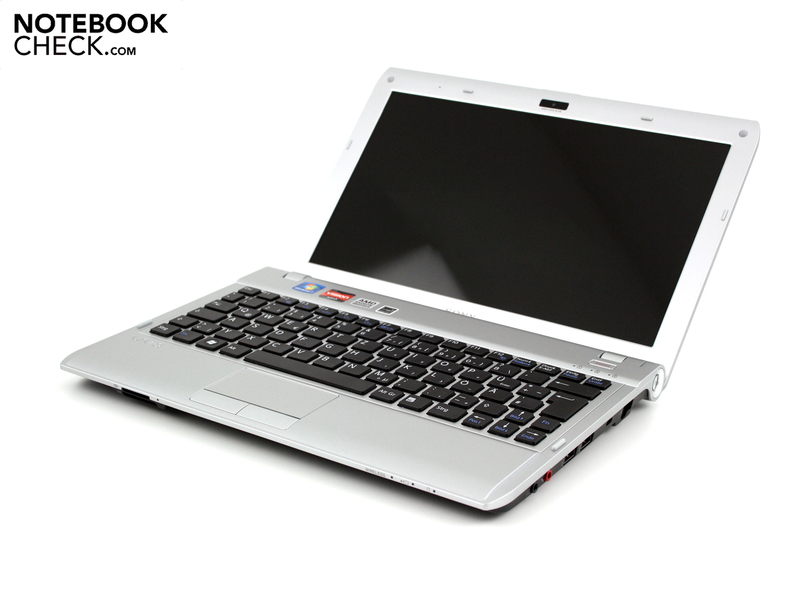 Sony Vaio VPC-YB1S1E/S: AMD Fusion based mini-subnotebook for a friendly Vaio price. 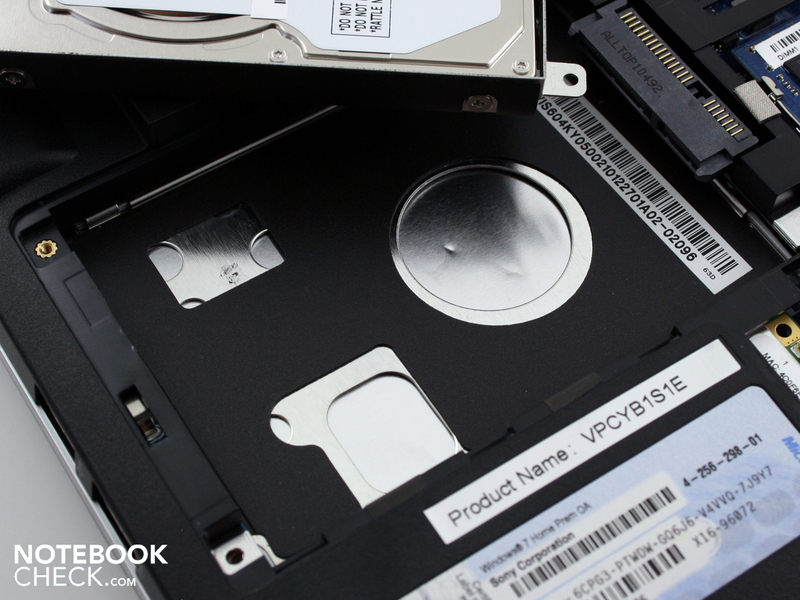 The Vaio VPC-YB1S1E/S brings AMDs mobile Fusion platform in an 11.6 inch form factor. The Lithium Ion accumulator has an approximate capacity of only 38 Watt-hours (3500 mAh). Resting without the battery: Possible, since the feet are not on the battery. The WLAN switch is at the front. Very good for quick switching in an air plane. Beneath the panel on the bottom are the internal components. as well as the RAM can be upgraded. With these efficient components it is possible to have five hours of mobility. 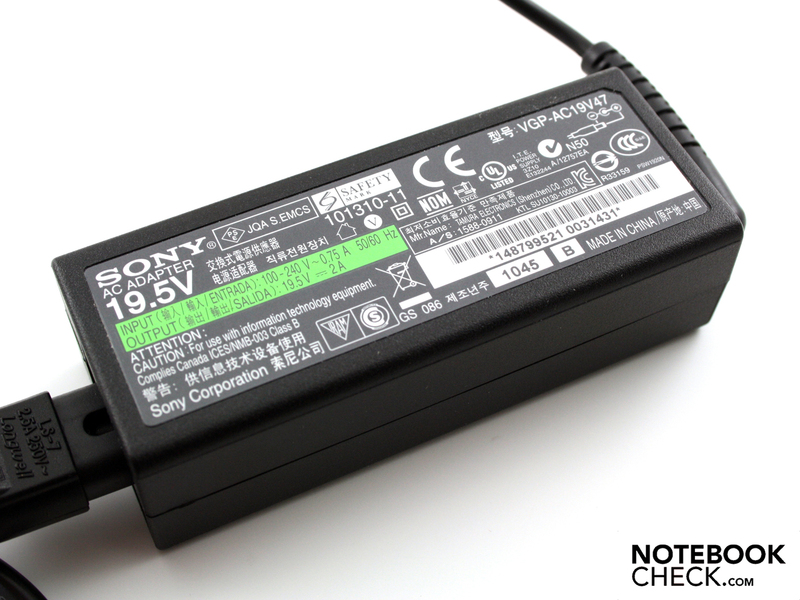 The practical 40 Watt AC adapter with 140 grams can therefore also be left at home. 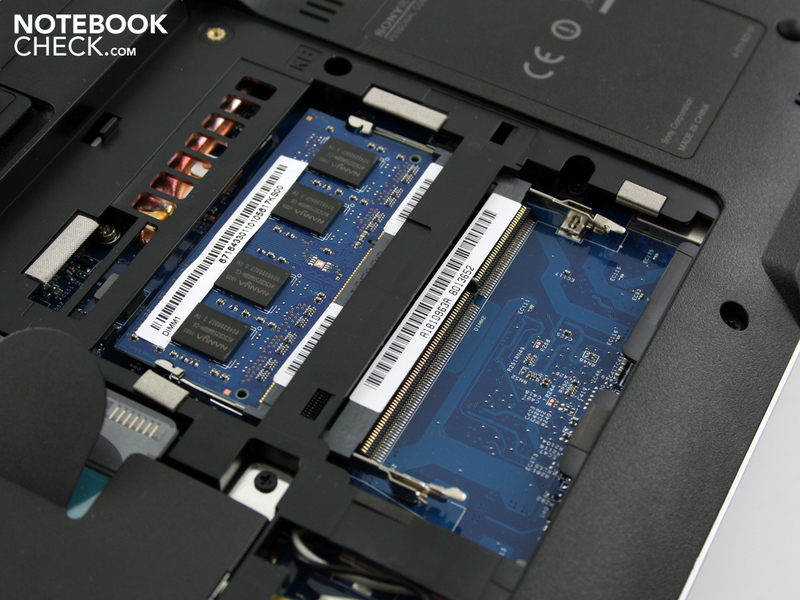 Vaio VPC-YB1S1E/S: Two RAM slots. It is removed with a rolling motion, and thus it sits securely. On the bottom the battery can be removed as usual. 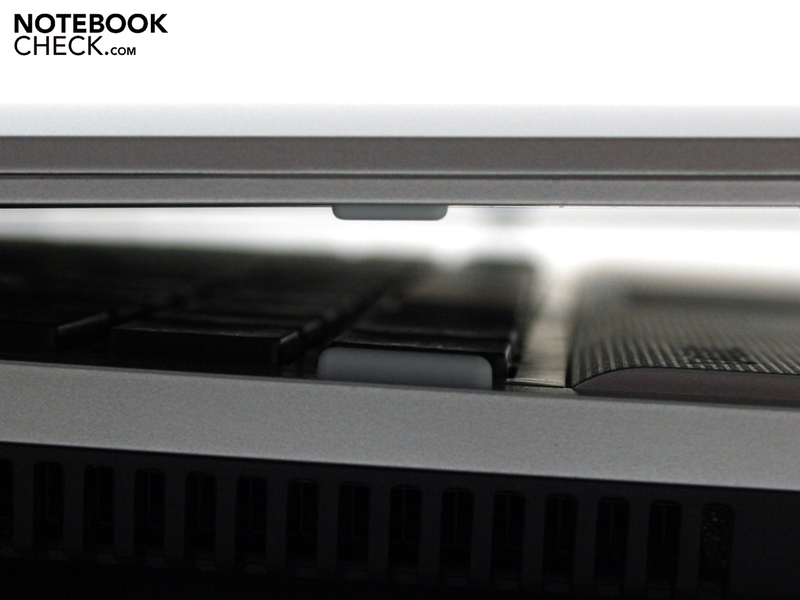 A closer look: Two rubber feet support the lid. Compact and handy; the mini is completely clad in matte plastic surfaces. The only reflective area is the display panel. Even the good brightness won't help much (not throttled when battery powered). The lid is silver colored - beware scratches. The chassis is rigid, and can't be bent. Details: Keys with an isolation look. 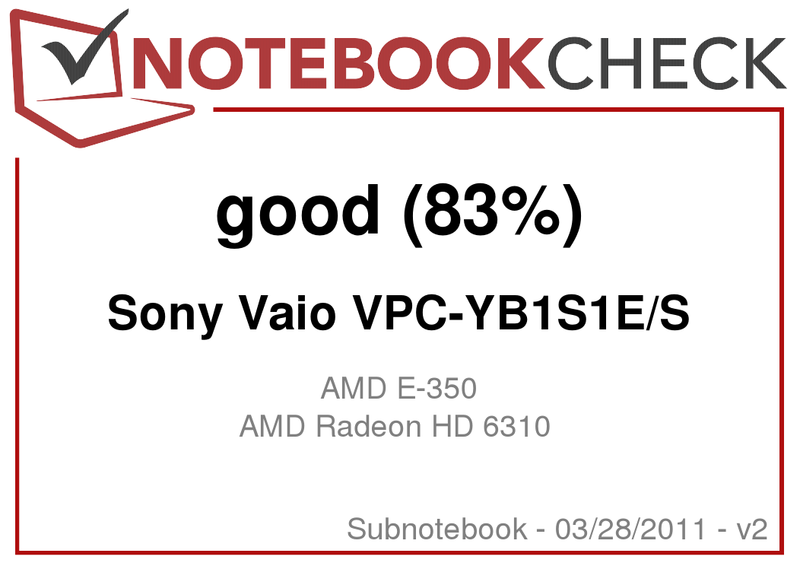 Vaio VPC-YB1S1E/S: AMD Fusion APU C-350 and Radeon HD 6310. Good battery life with AMD solution. The case stays cool at all times. A quiet cooling system, at least in an idle state. A non-reflective display for outdoor use. Here, in the 11.6 inch Vaio, the AMD C-350 APU is in its rightful place. 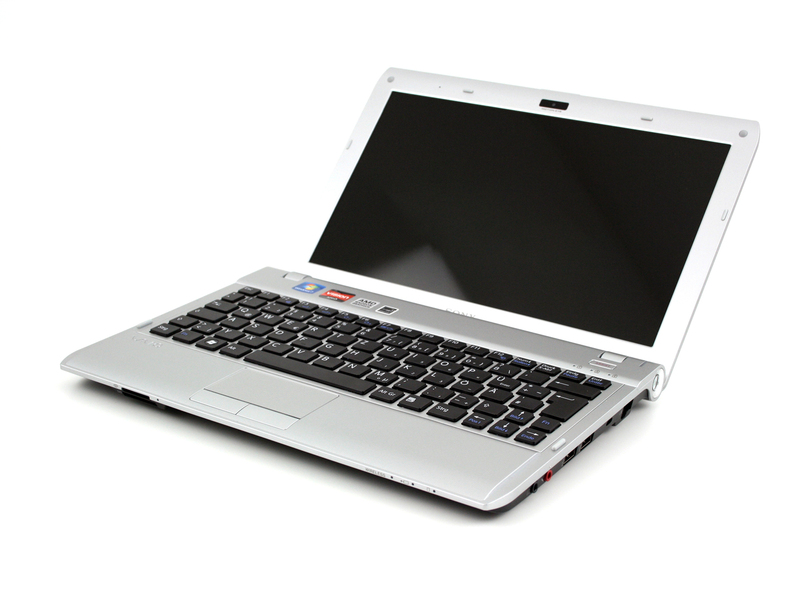 It is out of place in some of the 15.6 inch versions, since users will be disappointed by the weak performance. Lenovo IBM ThinkPad Edge 11: AMD, from 330 Euros; Lenovo IBM ThinkPad Edge 11 #2: i3-380UM under 600 Euros; Sony Vaio VPC-YA1V9E/B: Intel based sister for 650 Euros; Acer Aspire One 721: AMD based 390 Euros; Acer Aspire TimelineX 1830T: faster i5-470UM for 700 Euros; Lenovo IdeaPad U160: Celeron U3400 from 350 Euros; ASUS Eee PC 1215N: Dual Core Atom; Apple MacBook Air: 910 Euros; Acer TravelMate TimelineX 8172: strong battery life from 530 Euros; Acer Aspire 1551: AMD from 330 Euros; Lenovo IdeaPad U260: With i5-470UM, 1000 Euros expensive; Lenovo IBM ThinkPad X100e; from 540 Euros with AMD.